According to the Centers for Disease Control and Prevention more than 38,000 people died from drug overdose by prescription opiates in 2011 and the rate has more than tripled in the last 20 years. The CDC states that everyday 100 people in the U.S. die from drug overdose. Many more die in drug related incidents. An opiate is a narcotic derived from the opium poppy plant. Opiates are legally available in the U.S. by prescription, but are easily obtained illegally on the street. Opiates work as a pain reducer and sedative. Methadone, Dilaudid, Heroin and Oxycontin are all opiates and there are many more. Opiates attach to opioid receptors that are located in the spinal cord, brain and gastrointestinal tract and alter pain sensation, causing a sense of euphoria and contentment. Long term opiate users are at risk for dependency. As tolerance to the drug builds, there is a danger for additional health risks and long term consequences, this is when most people find Opiate Detox Treatment necessary. Opiate users may experience side effects when they first start using the drug with the most common being constipation and stomachache. Other less common side effects from opiate use include euphoria, dizziness and drowsiness, dry mouth, fatigue, depression, tremors, insomnia, low blood pressure, constricted pupils, confusion, constipation, abdominal pain and spasm; with more severe side effects primarily from overuse to include confusion and depression, clammy skin, circulatory collapse, coma and cardiac arrest. Abruptly stopping the drug may induce severe withdrawal symptoms depending on the amount used and the length of daily use. 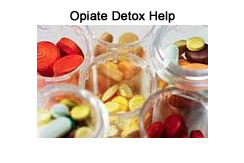 Medical detox is seen as the best method for withdrawal from opiate use. Withdrawal symptoms can include bone and muscle pain, insomnia, agitation and anxiety, uncontrollable movement of the extremities, sweating and runny nose, diarrhea, nausea and vomiting, chills and abdominal cramps. Withdrawal symptoms usually present within a few hours after the last dose and may continue for several days. Many report symptoms similar to the flu. Opiate Detox Treatment may include outpatient detox through a Methadone clinic in which you self report to the clinic to receive the drug Methadone. Outpatient detox allows you to detox at home and still maintain your daily routine. However Methadone is an opiate with much the same qualities as all other opiates. For detox purposes methadone is prescribed in decreasing dosages. Traditional hospital inpatient detox allows patients to stay for a specified amount of time and receive medication to detox. Most hospitals place patients on lockdown or in psychiatric units and the medication that is used is often times seen as less effective at relieving the patient's withdrawal symptoms. IV therapy medical detox is an inpatient detox and is seen by doctors as the most effective and safest way to detox from opiates. Detox through IV therapy removes the toxins that have collected in your system due to opiate use. Intravenous therapy allows the medication administered during detox to be adjusted to meet the withdrawal symptoms as they change which keeps patients much more comfortable. Once your opiate detoxification is complete, it may be essential for you to enroll in a program that will give you the tools to achieve long term success without drugs. Freedom Model Retreats offer a Cognitive Behavioral Learning program that can help you reevaluate your thoughts and choices, create new habits and reinforce those more productive habits with new behaviors that will help you build a life that is free from drug use permanently.